Temperatures were brutally cold today, ostensibly in the mid to upper teens but with wind chill making them feel ten degrees below that. As evening approached, notwithstanding my declaration last night that I would go photograph the Capitol Christmas tree, what I wanted to do was stay cozy inside playing Horizon Zero Dawn. I had already created a great Christmas image at the White House, after all. But the greatest rewards in photography, as in life generally, derive from perseverance. So I hardened my heart, armored myself in a plethora of Arc'teryx gear, and ventured outside. I'm glad I didn't chicken out. For one thing, if you dress properly, you can handle cold; the temperature was more a psychological hurdle than a physical one. For another, I found a lovely winter scene at the Capitol Building and its Reflecting Pool, with a gorgeous sunset over the frozen pool, on which visitors were actually walking (and slipping and sliding). I gingerly crep out onto the ice myself. I still fell twice, and my knee now feels sore from the impacts. But the experience was worth the ache. 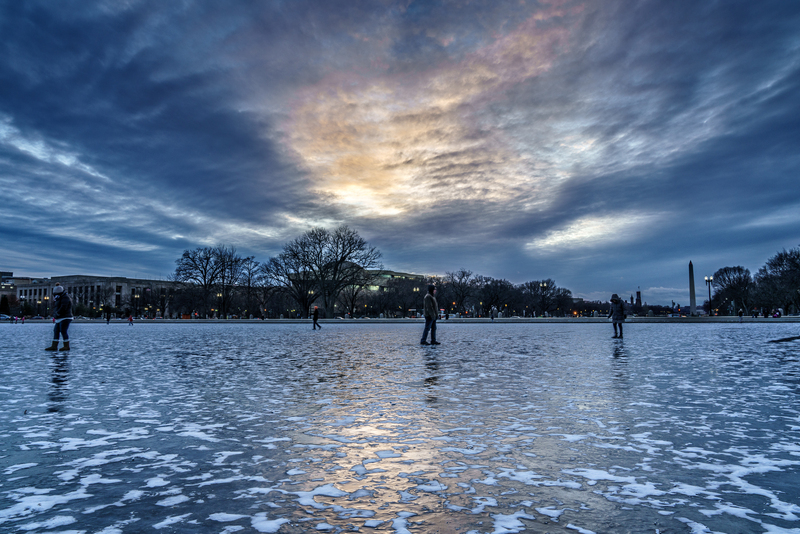 Walking across the ice by the Capitol Building was just fun, and it let me achieve some neat compositions, including this one looking across the ice toward the sunset and the Washington Monument. I did manage to capture this view without people in it, but this time, I thought the people make the image more interesting. Of course, I also took lots of photos of the Capitol Building and its Christmas tree, and I'll be posting one or two of the choice selections soon. But I love the sky and the ice of this scene and am eager to share it.